Cathryn Jakobson Ramin’s back pain started when she was 16, on the day she flew off her horse and landed on her right hip. For the next four decades, Ramin says her back pain was like a small rodent nibbling at the base of her spine. The aching left her bedridden on some days and made it difficult to work, run a household, and raise her two boys. At that point, Ramin decided to deploy her skills as a journalist and investigate the $100 billion back pain industry. She went on to write Crooked: Outwitting the Back Pain Industry and Getting on the Road to Recovery, an incredible tale of back pain and its treatment, published last May. The big takeaway: Millions of back patients like Ramin are floundering in a medical system that isn’t equipped to help them. They’re pushed toward intrusive, addictive, expensive interventions that often fail or can even harm them, and away from things like yoga or psychotherapy, which actually seem to help. Meanwhile, Americans and their doctors have come to expect cures for everything — and back pain is one of those nearly universal ailments with no cure. Patients and taxpayers wind up paying the price for this failure, both in dollars and in health. More and more people like Ramin are seeking out conservative therapies for back pain. While yoga, massage, and psychotherapy have been around for a long time, there was little high-quality research out there to understand their effects on back pain, and doctors sometimes looked down on these practices. But over the past decade, that’s changed. Lower back pain is one of the top reasons people go to the doctor in the US, and it affects 29 percent of adult Americans, according to surveys. It’s also the leading reason for missing work anywhere in the world. The US spends approximately $90 billion a year on back pain — more than the annual expenditures on high blood pressure, pregnancy and postpartum care, and depression — and that doesn’t include the estimated $10 to $20 billion in lost productivity related to back pain. 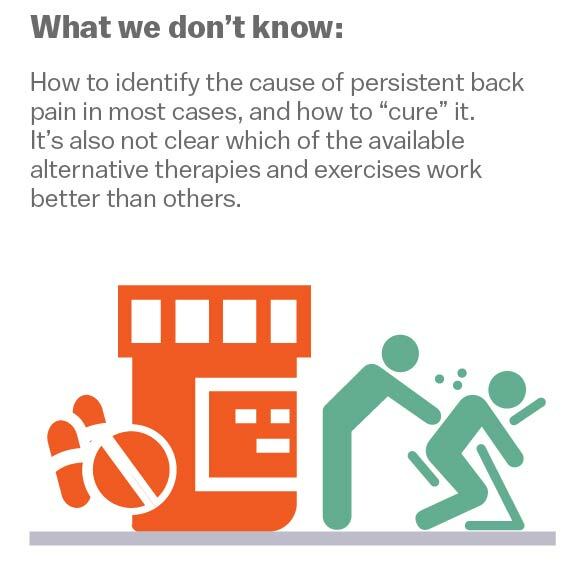 Doctors talk about back pain in a few different ways, but the kind most people (about 85 percent) suffer from is what they call “nonspecific low back pain.” This means the persistent pain has no detectable cause — like a tumor, pinched nerve, infection, or cauda equina syndrome. About 90 percent of the time, low back pain is short-lived (or in medical lingo, “acute”) and goes away within a few days or weeks without much fuss. A minority of patients, though, go on to have subacute back pain (lasting between four and 12 weeks) or chronic back pain (lasting 12 or more weeks). Chronic nonspecific back pain is the kind the medical community is often terrible at treating. Many of the most popular treatments on offer from doctors for chronic nonspecific low back pain — bed rest, spinal surgery, opioid painkillers, steroid injections — have been proven ineffective in the majority of cases, and sometimes downright harmful. Consider opioids. In 2017, more than 30,000 Americans will die from opioid overdoses. Opioid prescribing is common among people with back pain, with almost 20 percent receiving long-term opioid prescriptions. Here’s the outrageous part: All these opioids were being prescribed before we actually knew if they helped people with chronic lower back pain. It gets worse: Now high-quality evidence is coming in, and opioids don’t actually help many patients with chronic low back pain. This soon-to-be-published randomized controlled trial was the first to compare the long-term use of opioids versus non-opioid medications (such as anti-inflammatory drugs and acetaminophen) for low back pain. After a year, the researchers found opioids did not improve patients’ pain or function, and the people on opioids were actually in slightly more pain compared to the non-opioid group (perhaps the result of “opioid-induced hyperalgesia” — heightened pain brought on by these drugs). As for surgery, only a small minority of patients with chronic low back pain require it, according to UpToDate, a service that synthesizes the best available research for clinicians. In randomized trials, there was no clinically meaningful difference when comparing the outcomes of patients who got spinal fusion (which has become more and more popular in the US over the years) with those who got a nonsurgical treatment. Steroid injections for back pain, another popular medical treatment, tend to have similarly lackluster results: They improve pain slightly in the short term, but the effects dissipate within a few months. They also don’t improve patients’ long-term health outcomes. It’s not entirely surprising that the surgeries, injections, and prescription drugs often fail considering what researchers are now learning about back pain. Historically, the medical community thought back pain (and pain in general) was correlated to the nature and severity of an injury or anatomical issue. But now it’s clear that what’s going on in your brain matters too. 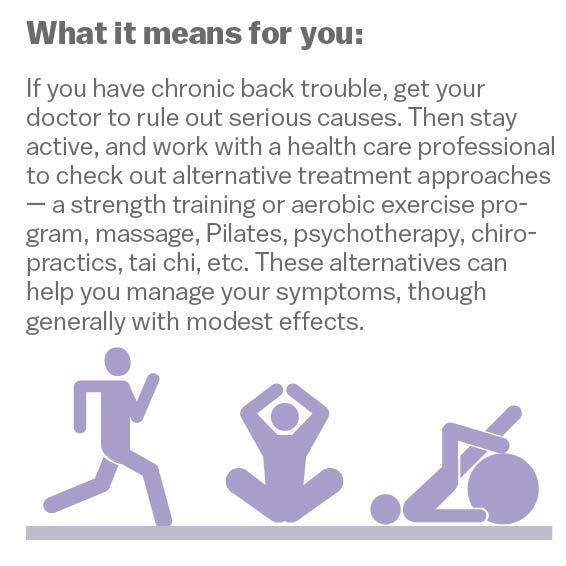 “Our best understanding of low back pain is that it is a complex, biopsychosocial condition — meaning that biological aspects like structural or anatomical causes play some role but psychological and social factors also play a big role,” Roger Chou, a back pain expert and professor at Oregon Health and Science University, summarized. For example, when you compare people with the same MRI results showing the same back injury — bulging discs, say, or facet joint arthritis — some may experience terrible chronic pain while others report no pain at all. And people who are under stress, or prone to depression, catastrophizing, and anxiety tend to suffer more, as do those who have histories of trauma in their early lives or poor job satisfaction. The awareness about the role psychological factors play in how people experience pain has grown more widespread with the general shift away from the dualist view of the mind and body toward the more integrated biopsychosocial model. Chronic nonspecific low back pain “should not been considered as a homogenous condition meaning all cases are identical,” researchers in one review of the research on exercise cautioned. A new understanding of pain called “central sensitization” is also gaining traction. The basic idea is that in some people who have ongoing pain, there are changes that occur between the body and brain that heighten pain sensitivity — to the point where even things that normally don’t hurt are perceived as painful. That means some people with chronic low back pain may actually be suffering from malfunctioning pain signals. Despite the clear risks, doctors have continued to prescribe painkillers, and perform surgeries and injections, sometimes to patients who won’t take no for answer or who can’t afford to try alternatives (which usually aren’t covered by insurance plans). Slowly, though, the tide is shifting. Medical societies and public health agencies are now advising doctors to try less invasive options and even alternative therapies such as acupuncture before considering opioids or surgery. Most recently, in February 2017, the American College of Physicians advised doctors and patients try “non-drug therapies” such as exercise, acupuncture, tai chi, yoga, and even chiropractics, and avoid prescription drugs or surgical options wherever possible. (If the non-drug therapies fail, they recommended nonsteroidal anti-inflammatory drugs as a first-line therapy, or tramadol or duloxetine only as a second-line therapy.) In March 2016, the Centers for Disease Control and Prevention also came out with new guidelines urging health care providers to turn to non-drug options and non-opioid painkillers before considering opioids. At the same time, research has mounted suggesting active therapies (exercise programs, yoga, tai chi) can really help people work through back pain, and alternative approaches (massage, spinal manipulation) can be effective, too — with the caveat that they’re often no panacea and the effects tend to be short-lived and moderate. But most of the alternatives also carry little or no harm (except to patients’ pocketbooks) — which makes them all the more appealing amid the historic drug crisis. When back pain strikes, your first instinct may be to avoid physical activity and retreat to the couch until the pain subsides. But doctors now think that in most cases, this is probably the worst thing you can do. Studies comparing exercise to no exercise for chronic low back pain are consistently clear: Physical activity can help relieve pain, while being inactive can delay a person’s recovery. Exercise is helpful for a number of reasons: It can increase muscle strength, which can help support the spine; It can improve flexibility and range of motion in the back, which can help people’s functional movement and get them back to their normal living; it can boost blood flow to the soft tissues in the back, which promotes healing and reduces stiffness. 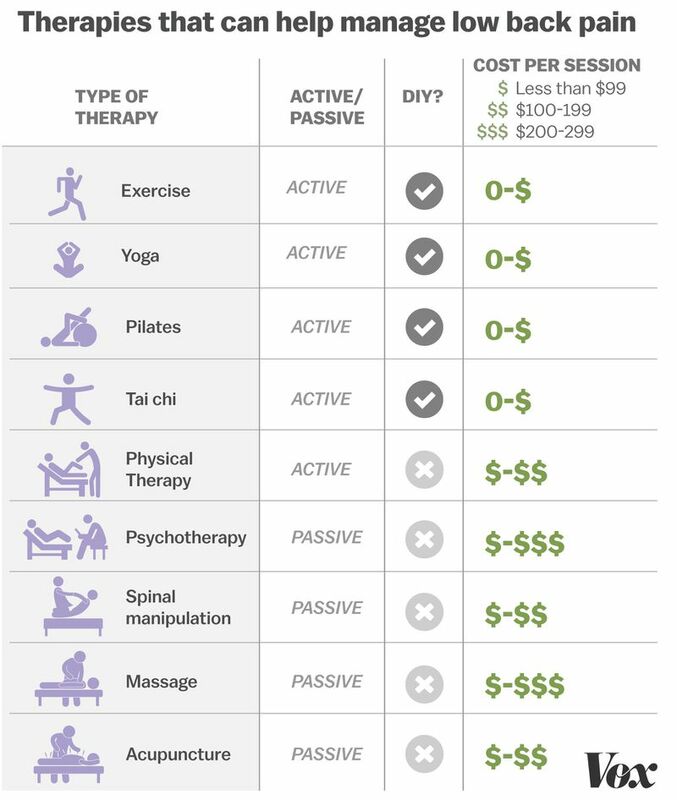 These are just a few reasons why researchers who study back pain suggest opting for exercise before some of the passive therapies like acupuncture or massage (we’ll describe those later). Those researchers suggested that a combination of exercises — strength training, aerobic exercise, flexibility training — may be most helpful to patients, and that there seemed to be no clear winners among the different approaches but that each had its own benefits. “My general take,” Chou said, “is that all [exercise types] seem to work.” If people find a program that makes them feel better, he added, they’ll probably see benefits not only with their back but with their overall health and sleep patterns, too. To be clear, exercise doesn’t always help with those short-lived acute episodes. But if you have chronic back pain, you’ll want to find ways to work through the discomfort and keep active. Next, we’ll turn to some more specific exercises that are popular (and well studied) for back pain. So again, this isn’t an end-all treatment — but the evidence we have points in the direction of a benefit. Importantly, the review authors also noted that it’s not clear whether yoga is better than other exercises, since there were few head-to-head comparisons tracking yoga against other kinds of workouts. As for tai chi and Pilates, the Agency for Healthcare Research and Quality (AHRQ), a federal agency that crunches the best available data on the effectiveness of health care interventions, recently published a comprehensive 800-page systematic review of research on noninvasive treatments for low back pain, including these two kinds of exercises. It found tai chi seemed to reduce chronic back pain and help people return to their daily activities when compared with no exercise, and that it was more effective in alleviating pain than backward walking or jogging but not necessarily better than swimming. For Pilates, the evidence was a little more mixed: It was associated with small or no effects on pain and no effects on function compared with other types of exercise. Again, though, pretty much every back expert I spoke to said any exercise is better than no exercise, so if Pilates is something you enjoy, do it. Ramin, the journalist and author of Crooked, makes a compelling argument for seeking out a specialist who deeply understands the back to tailor an exercise program that targets your specific pain. These “back whisperers” come from many different backgrounds: doctors of physical therapy with an orthopedic clinical specialist certification, personal trainers with a degree in exercise science, physical therapists. 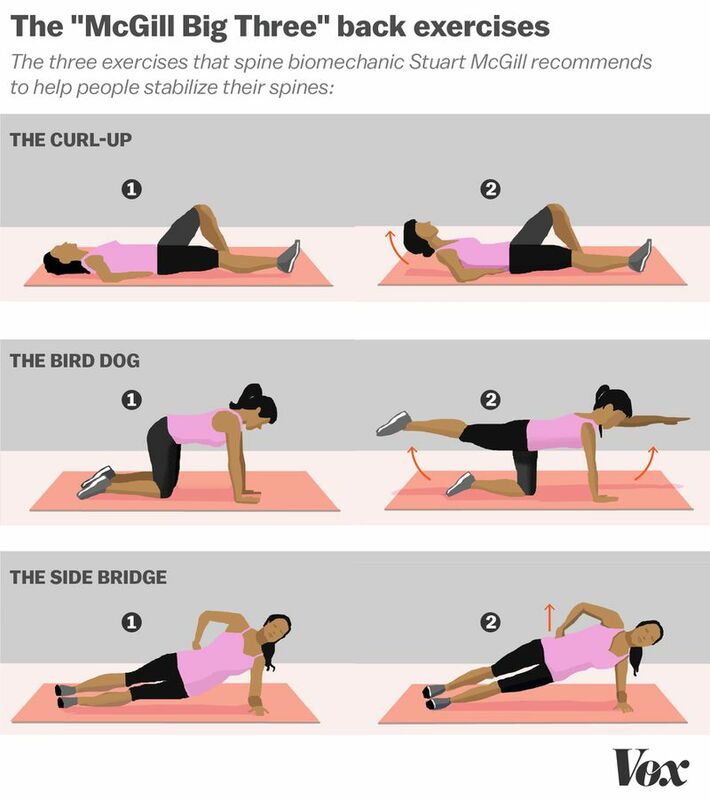 McGill has a set of spine-stabilizing exercises — the McGill Big Three, which Ramin does daily — based on research in his lab that are targeted at people with chronic back pain. It can be difficult to find someone with the expertise of a back whisperer like McGill, and their time can also be costly. 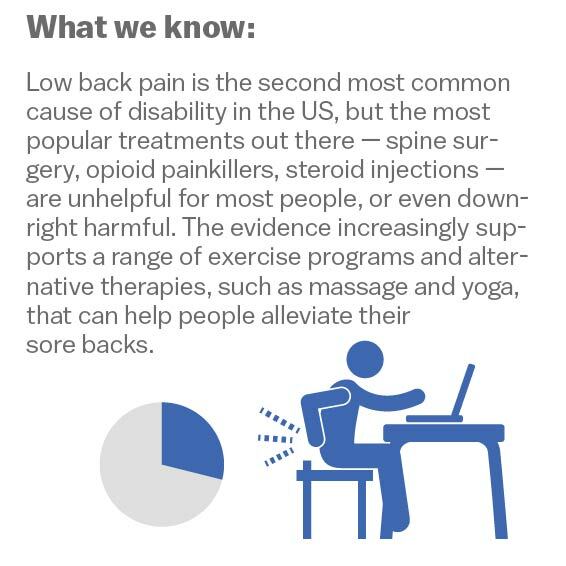 There’s also no study that brings together research on these folks, but if you can find a good one who works for you, your back pain could be improved. So where does physical therapy — usually a combination of guided exercises, mobilization, superficial heat or cold, and health advice — fit into the back pain treatment picture? Nowadays, though, there are also several different kinds of physical therapies that also integrate psychotherapy or cognitive behavioral therapy, often called multidisciplinary rehabilitation. Multidisciplinary rehab takes the “biopsychosocial” view of back pain — again, that the pain arises from the interplay of physical, psychological, and social factors. It can of course be tricky to disentangle whether mood disorders like anxiety or depression contribute to people’s pain, or whether they arise out of the pain, but either way, the biopsychosocial model views the physical as only one part of the equation. So these practitioners deal with what’s going on inside the head as part of their back pain therapy — helping patients get treatment for their depression or anxiety, or guiding them through cognitive behavioral therapy to improve their coping skills. Perhaps not surprisingly, multidisciplinary therapy appears to work slightly better than physical therapy alone for chronic back pain in both the short and long term. Patients who get these more holistic treatments are also more likely to return to work. Passive therapies can also play a role in helping people manage back pain, though there’s no silver bullet among them, and their effects also tend to be modest and short-lived. (Again, active approaches to managing back pain should be your first stop.) The research base for these alternative therapies is also generally weak: There’s a lot of variability among the practice styles and programs on offer, even within one category of treatment like massage. It can be difficult to blind the patients to the treatment they are receiving, and the people who seek out particular therapies — acupuncture, massage — are probably more amenable to them, which may bias the results. With that said, here’s what we know. Spinal manipulation, the cranking and tweaking on offer when you visit a traditional chiropractor, is among the most popular approaches to back pain. Practitioners lay their hands on the patient and move their joints to or beyond their range of motion — a technique that’s often accompanied by a pop or crack. There is some evidence the approach can help people with chronic back pain — but not any more than over-the-counter painkillers or exercise, and you need to take precautions when seeking out a chiropractor. First, a quick look at the evidence. There are two recent Cochrane reviews on spinal manipulation for low back pain: one focused on people with acute (again, episodic/short duration) pain and the other on chronic pain. The 2011 review on chronic low back pain found that spinal manipulation had small, short-term effects on reducing pain and improving the patient’s functional status — but this effect was about the same as other common therapies for chronic low back pain, such as exercise. That review was published in 2011; UpToDate reviewed the randomized trials that have come out since — and also found that spinal manipulation delivered modest, short-term benefits for chronic back pain sufferers. The Cochrane review on acute pain found that spinal manipulation worked no better than placebo. So people with a short episode of back pain should probably not bother seeing a chiropractor. As a chiropractor himself, he had some advice for patients: They should avoid chiropractors who routinely make X-rays or do advanced diagnostics for low back pain because this adds nothing to the clinical picture, particularly in the case of nonspecific low back pain. Patients should also beware chiropractors who put them on extended programs of care. While the risks of serious side effects from spinal manipulation for back pain are rare — about one in 10 million — the risks associated with chiropractic therapy for neck pain tend to be slightly higher: 1.46 strokes for every million neck adjustments. The issue is the vertebral artery, which travels from the neck down through the vertebrae. Manipulating the neck can put patients at a higher risk of arterial problems, including stroke or vertebral artery dissection, or the tearing of the vertebral artery (though Rubinstein noted that people in the initial stages of stroke or dissection may also seek out care for their symptoms, such as neck pain, which makes it difficult to untangle how many of health emergencies are brought on by the adjustments). In general, massage therapists work by manipulating the muscle and soft tissue of the back and body. There are many, many different styles of massage: Swedish, deep tissue, sport, myofascial release, Thai, the list goes on. Massages also vary in how long they last, how much pressure is used, and how frequent sessions are, which makes the evidence for massage pretty difficult to interpret. But there’s good news here: Massage is pretty harmless, and the researchers who study back pain say the approach makes sense from a pain relief perspective. So it may be worth trying. According to AHRQ, for subacute (lasting between seven and 12 weeks) and chronic low back pain, massage seems to improve symptoms and function in the short term (i.e., one week) — but there’s no evidence that it leads to any long-term change. At best, you’ll get a bit of immediate relief, but nothing lasting. The Cochrane systematic review on massage for low back pain looked at 25 trials on massage and, like AHRQ, found short-term improvements in pain and function for both subacute and chronic low back pain but a very mixed evidence base. One of the oldest approaches to back pain is acupuncture, a core part of traditional Chinese medicine. The philosophical underpinning of acupuncture is that disease or pain in the body is the result of imbalances between the body’s “yin and yang forces.” “Vital energy circulates throughout the body along the so-called meridians, which have either Yin or Yang characteristics,” the Cochrane authors explain. Using needles to stimulate the parts of the body that are located on these meridians can modulate pain or reverse disease, practitioners claim. A 2005 Cochrane review looked at the evidence for acupuncture and low back pain and came to a few useful conclusions: There was “insufficient evidence” to make any recommendations about acupuncture for acute low back pain — so it may or may not help people. For chronic pain, acupuncture seemed to offer more pain relief when compared with no treatment or sham acupuncture (when practitioners use needles that don’t actually penetrate the skin). The needling also improved function in the short-term when compared with no treatment for chronic pain sufferers. But acupuncture was not more effective than other treatments. UpToDate looked at more recent research and noted that the studies on acute pain were still limited, and that evidence for acupuncture’s effects on chronic pain is somewhat conflicting. The review also noted it was unclear whether acupuncture’s benefit lies in the needling, or in the placebo effect. The author of the Cochrane review, Andrea Furlan, pointed to a more recent randomized trial, which came out in 2009 after her review was published: It also found that acupuncture seemed to reduce chronic low back pain — but it didn’t seem to matter where the needles were placed, raising questions about the meridian philosophy guiding the practice. This is what makes acupuncture controversial. Science suggests it might work — but the squishiness of the findings, combined with the lack of scientific underpinning in acupuncture’s philosophy, leaves room for interpretation. And evidence-based medicine thinkers and skeptics view the results of studies as suggestive of nothing more than acupuncture’s potent placebo effect. Researchers have found that the more dramatic the medical intervention, the stronger the placebo effect. And getting poked all over the body by needles is a pretty dramatic intervention. (See this classic study comparing water injections with sugar pills for migraines, as well as Vox’s placebo explainer by Brian Resnick.) That’s not to mention you can never run a double-blind placebo — the gold standard in health research — on acupuncture, since that would involve both practitioners and patients not knowing (or being blinded to) what treatment they are giving and receiving. There’s a pretty simple adage public health officials stick to: Make it easy for people to stay healthy, and make it hard for them to get sick. When it comes to back pain in America, we make it easy for people to get sick and hard for them to stay healthy. There’s a complete disconnect between what insurance providers will cover for people and what actually helps their back pain. It’s still much easier to get your opioids or back surgery paid for by your insurance provider than to get a massage or exercise program reimbursed. More states need to move in the direction of places like Oregon, where insurance payers are making the default options for people with back pain healthier by expanding access to, and coverage for, non-drug options. For example, the Oregon Health Plan (the state’s version of Medicaid, federally funded health insurance for the poor) has ensured that alternatives like acupuncture and physical therapy are covered. It’s also expanded access to treatment for the behavioral health factors that are associated with back pain (such as depression and anxiety) by paying primary care clinics extra to be able to hire behavioral health specialists and meet patients who may not have had access to those services. Finally, it’s opened non-medication pain clinics, where people with low back pain can get a range of treatments as well as help to taper off their opioid prescriptions. Officials in Oregon haven’t yet determined the cost of this new scheme, but opioid prescriptions are already down. Shah also said he’s confident that the measures are bound to reduce the cost burden overall, since alleviating pain can help people can get back to work and bring down the numbers of opioid deaths. 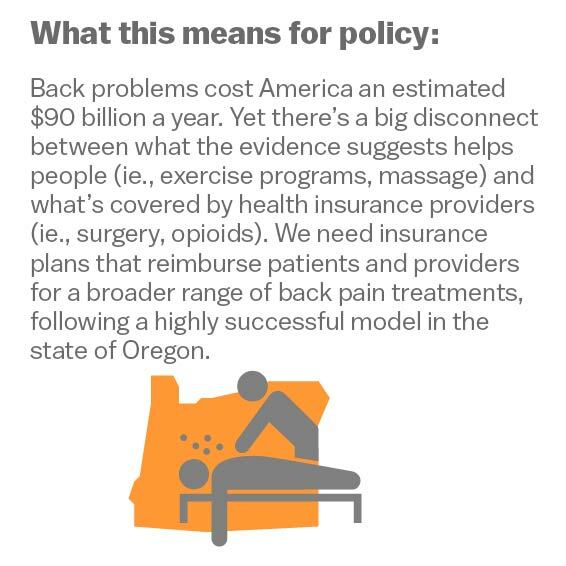 If only other states would follow Oregon and take back pain this seriously. I found the Agency for Healthcare Research and Quality (AHRQ), a federal agency that crunches the best available data on the effectiveness of health care interventions and had recently (February 2016) published a comprehensive 800-page systematic review of research on noninvasive treatments for low back pain. The AHRQ review covered 156 of the best back pain studies from 2008 to April 2015. I then searched for low back pain–related systematic reviews on PubMed Health, the government search engine that specializes in systematic reviews and meta-analyses, to cover the recent period left out of the AHRQ review (from May 2015 to the present, July 2017). To make sure I wasn’t missing anything, I consulted the chronic and acute low back pain articles on UpToDate, (a service that synthesizes the best available research for clinicians), the Cochrane Library of systematic reviews, and guidelines.gov, and sometimes followed the footnotes in these reviews to other studies. Ramin’s book Crooked was also an excellent source for thinking on back pain. Finally, I conducted interviews with nine back pain doctors and researchers, including authors of many of the systematic reviews referenced here. Special thanks: Mohsin Ali for research assistance and Hilda Bastian for advice on searching the medical literature.